Unfortunately, due to my short vacation things seemed to have slow down. I’m back and working towards getting things going again. I want all members and future members that as well as the event there are three quests available in Traverse Town that can be done at the same time as the event. There are two quests, one light and dark, that are adventures for all chosen. There is also a battle for those wanting to square off against the heartless and try out the stat system. The request board is (here) for Traverse Town. Even though these are all group roleplays, simply request which quest you would like to do even if your solo and I’m sure I can find you a group or even use my own character. All quests are guided by me or any future DMs, but that doesn’t stop you from creating your own adventures with others. Little late on this, but the site is officially open. There is an event anyone can jump into. Along with that, there are several quests that members can join together and get started even during the event or simply roleplay if they wish. The event will not prevent other roleplays. I’m in the process of refining synthesis which would mainly be used later for chosen. Some of the materials may be changed and recipes for better equipment and other stuff will be added as well. 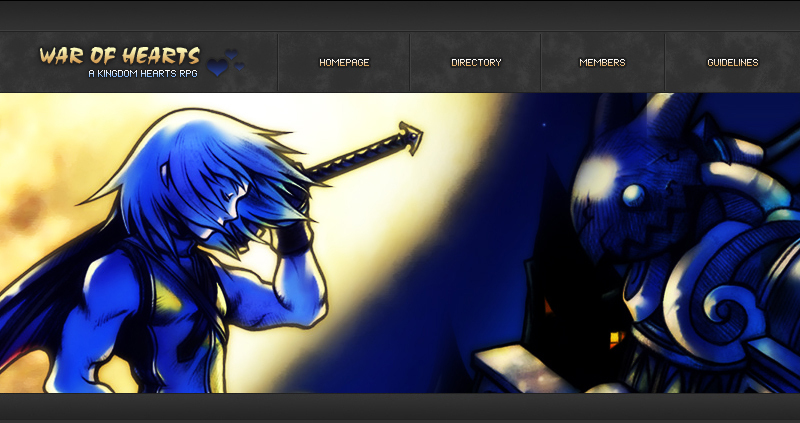 Over the past 2 weeks or so, I’ve been reworking the site mechanics to better fit Kingdom Hearts. Agility has been removed, leaving just the stats from the game. Along with that, all stat numbers have been greatly reduced making them much easier to deal with. Classes have also been improved on by having them decide starting stats and stat growth, traits will allow players to customize their characters, as well as more abilities from the games. Along with other changes to fit into the new stat system, Midgar will be added as a planet. I am now accepting bios as enough is done for that, but official site opening with event will be Wednesday or Thursday. With launch coming up, the site is now enough complete for bios completed and approved. Over the next few days I’ll be going over the site to make sure everything is ready and making sure the old content was changed into the new format. Some things that are for later levels is being held off till after launch such as Summoner, Sage, and Keyblade Master. One of the biggest changes is the taking out of story mode and rather running a smaller version of that through quests, missions, events, and random RPs. Basic roles got changed into classes and given more content to make it last throughout a chosen’s levels. Advance roles also got more defined and just called roles. The basic setup of synthesis got added as well as a list of predetermined equipment to choose from. The rest of the site got an overhaul as well to make sure it was more well defined and easy to understand. This following week will be almost like a beta test, though everything will carry over. If there are any suggestions or questions, please post them on the forum as they are greatly appreciate. If anyone was here for the last launch, they will get some percentage of their words to transfer over to their new chosen. The site is currently being revamp to fix any errors such as things not being well defined. It will also no long offer a story mode, but just general rp. The Narrator will still be a part of the story and will enter threads from time to time to spice things up. It will also hold events for members. The classes and role are getting to biggest revamp and weapons and armor will be more defined by specific equipment to choose from. More info on all chances will be on their specific pages once they are done. C h o s e n.
F o r u m.
R o l e s.
O r g a n i z a t i o n.
A b i l i t i e s.
A r m o r y.